TRAP – Normalcy Bias can kill you quicker than Competency Bias. In an earlier “TRAP” I wrote about Competency Bias (TRAP – Competency Bias can kill you), now I will warn you against Normalcy Bias. 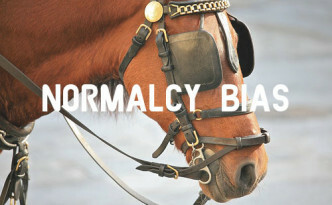 Normalcy BIas is the refusal of your brain to accept that something has happened, will happen, or to what extent something has happened. Example #1: You read about the hurricane coming but you don’t do anything about it because it has never happened to you and your hometown before. Then BAM! It hits and water is up to your roof line and you are wondering if you are going to make it out alive. Example #2: You hear that the President may outlaw guns. You say to yourself, “Naw! Congress will never let that happen.” Boom! He does it by Executive Order and Congress doesn’t challenge him on it. 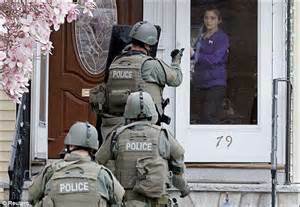 Next thing you know folks in tactical outfits are showing up to confiscate your guns because you are a known prepper. Oooooppppppssssss…..
Don’t let yourself get complacent and think things are always “normal” and nothing unusual will happen. Abnormal does and it will happen. There is an old saying “Expect the unexpected.” Sounds like a good thing to remember…and plan for. If you fail to recognize reality for what it is, reality will give you a wake-up call…or say “good night” to you and your family. This entry was posted in Tips & Traps. Bookmark the permalink. ← TRAP – Competency Bias can kill you. When the door kicking enforcers start to get gunned down in large numbers by The Bitter Clingers,(BC), then what? The president will have to suspend the BOR & US constitution in order for this to happen anyway. So the BC will have seen this coming, giving ample time to set traps for the orcs. In the end them rights on the parchment COME FROM THE GOD ALMIGHTY, so now we have laws of man in conflict with the laws of our Lord and Savior. Now there’s a tuff one for some to decide. It’s going to be ugly if #2 is tried anytime soon. This population, USA, needs a majority of imports/replacements and dumb citizens. So there’s just too many boomers alive at the moment. I’m guessing these shenanigans will be tried after the boomers are cold. My 2cents ref coa 2.